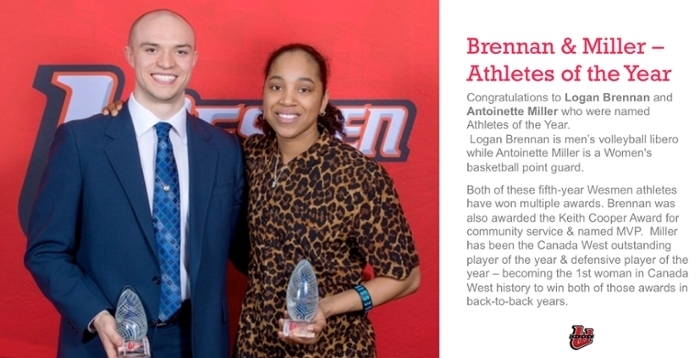 Congratulations to our Wesmen Athletes of the Year Logan Brennan (men's volleyball) and Antoinette Miller! (women's basketball). Photo: Kelly Morton. The Gupta Faculty of Kinesiology and Applied Health combines and integrates the academic, teaching, and research capacity of the Department of Kinesiology and Applied Health, and the administrative and programming strengths of the Department of Athletics and Recreation Services. The Department of Kinesiology has 5 concentrated programs of study: Athletic Therapy, Teaching (Physical Education and Health), Exercise Science, Coaching, and Kinesiology (general degree - based on your area of interest). 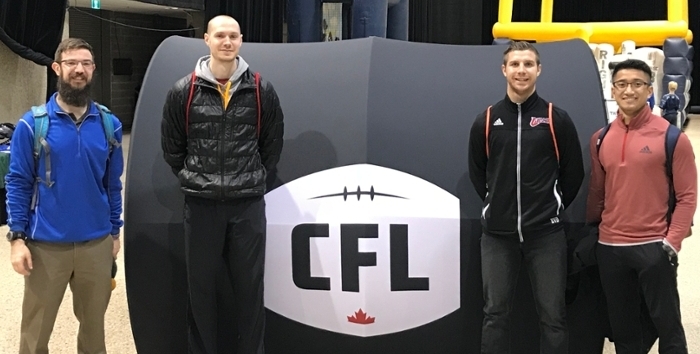 Our faculty members have varied research interests which include: physical activity and aging, concussion in sport, clinical biomechanics, and the use of motivational imagery by athletes - to name a few. The Athletics Department has a longstanding, successful men's and women's Wesmen basketball and volleyball programs as well as a women's soccer team which plays in the indoor field house (RecPlex). At no extra cost, all UWinnipeg students have access to Wesmen games and Athletic Facilities, including the Bill Wedlake Fitness Centre and the Axworthy Health & RecPlex which are managed by Recreation Services. In the classroom, on the court and in the community, there are many ways to discover, achieve, and belong in the Gupta Faculty of Kinesiology & Applied Health.